Made of powder coated aluminum frame, the chaise lounge set look amazing enough for inside and outside your home, but are rugged enough to handle anything Mother Nature can throw at them. Double chaise with an adjustable back and ultra-comfortable cushions with end table beside, once you lay down you aren't going to want to get up. The back has 3 different positions it can be adjusted too, ensuring that you will find degree of comfort. 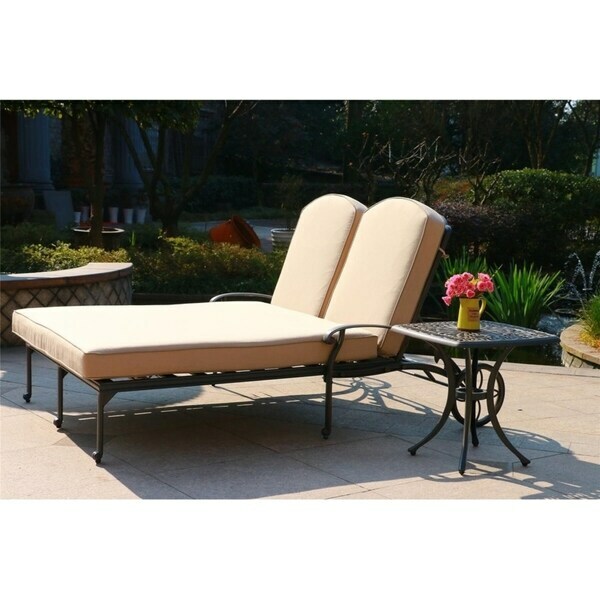 Double Chaise: (W) 86.6 in. x (H) 39.2 in.x (D) 55.98 in. End Table: (W) 21.06 in. x (H) 21.06 in.x (D) 21.06 in. Dimensions 87.0 In. X 81.0 In. X 40.0 In.